Last night I stepped into the newly renovated Mayflower Theatre in Southampton with that excitement I always get when I go to the theatre - it always feels like a proper treat! I was over the moon to be invited to watch and review Jersey Boys, a musical that’s been on my to-watch list after my parents thoroughly enjoyed the musical in Vegas a few years ago. My expectations were that it would be a Bohemian Rhapsody/Mamma Mia situation where a fictional story had been written around the songs of Frankie Valli and the Four Seasons. However, it’s more of a musical biopic of how the ‘60’s supergroup came together, their turbulent adventure to top the charts, the ups and downs of their personal lives and the stories behind some of their hit songs like December 1963 (Oh What a Night!) and Can’t Take My Eyes Off Of You. 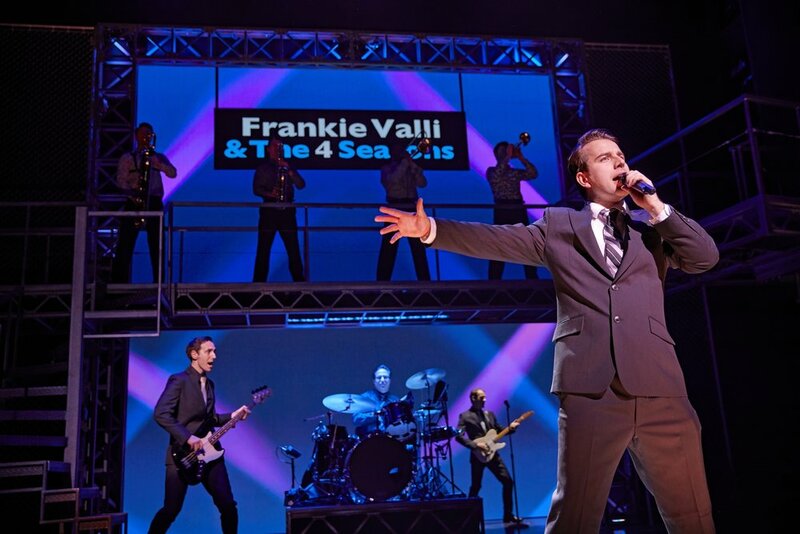 Jersey Boys was to me more like a play; the characters Frankie Valli (Michael Watson), Tommy Devito (Simon Bailey), Bob Gaudio (Declan Egan) and Nick Massi (Lewis Griffiths) narrate the story to us in soliloquies as they set the scene of New Jersey and the lifestyle and music of the time. This becomes important as the story unfolds when the wild Tommy Devito gets the band into all sorts of trouble with his scheming and connections to the mafia... It was also interesting to hear their style develop as the band find their sound and a name that stuck, as they compete to be heard in the super competitive music industry. We’re taken on a ride with the ever-moving set and props and I really liked the visual storytelling from the Roy Lichtenstein style pop-art and signage. We were all tapping our feet as the cast performed the hits Beggin, Sherry, Big Girls Don’t Cry, Walk Like a Man, Bye Bye Baby and even a few songs I didn’t realise were written by the band! My favourite moments were when they recreated the Television broadcasts and included archive footage of screaming fans in the audience from their performances in the 1960s. The instruments also featured on stage as well as in the pit which is something I’ve not seen before. The drummer was on stage and in the scenes most of the time on a drum kit that whizzed around the stage! The cast were so engaging and their harmonies were awesome; they really got the audience clapping and dancing along, it almost felt like a gig! Overall, it’s a great musical and I love learning about pop culture and stories behind the music. You really connect with each character’s story and if like me, you knew the songs of the Four Seasons but nothing at all about the members, you leave feeling like you want to learn more about them. Thank you to the Mayflower Theatre and Southampton Bloggers for the gifted tickets!